We’ve got just the lawyer for your nightlife needs. He’s a fella by the name of Eddie O’Hare. Find the door to this law office on downtown’s Fifth Avenue and be transported back a century with low-lighting, craft cocktails, and a cellphone- and flip-flop-free bar. If you’re heading to the restroom of East Village eatery Neighborhood and watch someone disappear behind a stack of kegs, don’t worry, you’re not seeing things. Booking a reservation is the only way to get inside this small and immaculately-appointed bar adorned with a wall of skulls. Pass through a walk-in cooler inside Little Italy’s Craft & Commerce to find this immersive tiki bar, a collaboration between CH Projects and tiki expert Martin Cate (of San Francisco’s Smuggler’s Cove fame). This diminutive tiki bar has made a name for its strong cocktails and syrupy-sweet cave-like ambiance, where no detail has been left unturned. Seven Grand’s whiskey selection only gets more impressive when you open the unadorned door to Bar Three Piece, whose 250 bottles will take some time to sample. 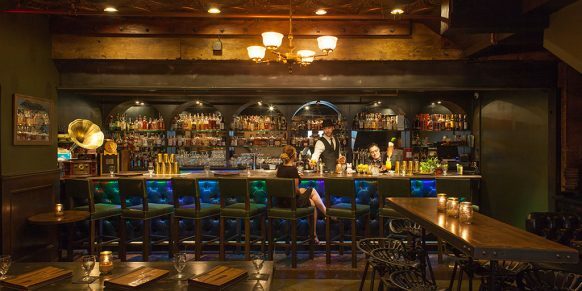 The hardwood floors, oil lanterns, and booths are modeled after Japan’s decadent whiskey bars. Hand-rolled cigars from Nicaragua can be puffed with a whiskey on the private patio. Instagram is the ticket for finding the entry password of the day. But that will be the last touch of modern life before entering this Carlsbad establishment where flash photography and phones are verboten, men must ask the bartender for an introduction to women, and hats must be doffed. You’ll have to forget everything you think you know about malls to believe that this upscale retail store/hidden bar exists in Westfield UTC. Believe it, though: a rotating fireplace platform is the entryway to the bar where you can order some of San Diego’s favorite cocktails (this venture is from the same folks behind False Idol and Noble Experiment) and exorbitantly expensive drinks (a $790 Old Fashioned, for example). Good luck trying to find your way into this Alice in Wonderland-themed wine bar that lies behind a hidden door. Its subterranean location, plus the fact that it’s a must-know San Diego establishment, land it on this list. Call it what you will, the small-bite menu, wine, and cocktails are not to be missed. The whiskey doesn’t stop flowing beyond the walls of Urge Gastropub. You can see where this is going: in the direction of another quasi-secret speakeasy. This copper-tinted reverie does it particularly well thanks to understated cocktails, strict crowd control (no more butts than seats are permitted in the house), dark leathery décor, vintage glassware, and other elegant touches. Reservations can be made online or by checking their Instagram account for passwords.